On Monday, Queen Beatrix of the Netherlands announced that she would abdicate the throne to her eldest son, Crown Prince Willem-Alexander, on April 30, 2013. 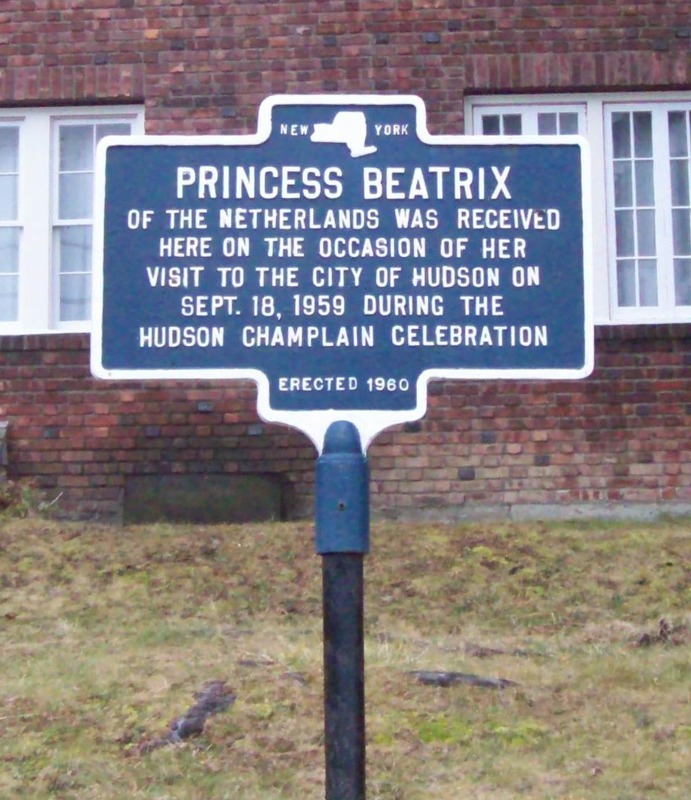 That event, and that fact that today was Queen Beatrix's seventy-fifth birthday, prompted Gossips to recall when Beatrix, then twenty-one and the Crown Princess of the Netherlands, visited Hudson on September 18, 1959, for the celebration of the 350th anniversary of Henry Hudson's discovery of the Hudson River. The historic marker in front of this house on Prospect Avenue, across from Cavell House, commemorates the royal visit. 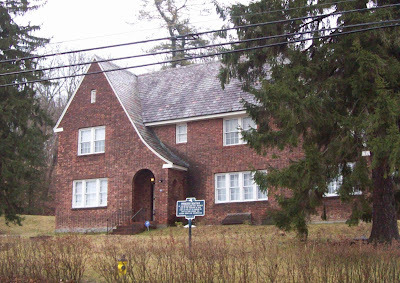 In 1959, this was the home of Dr. John L. Edwards--for whom the school was named--and it was here that the princess and her entourage came first, upon arriving in Hudson, to be received by the committee that had planned the "Columbia County and Hudson City Hudson-Champlain Celebration" that was the culmination of the "Year of History." 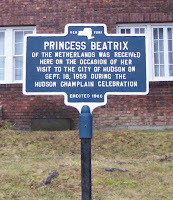 From here, Princess Beatrix proceeded to Park Place, where she reviewed what was probably the biggest parade in Hudson's history. The following is the account of the visit that appeared in the Chatham Courier. Columbia Country received a real Dutch treat Friday afternoon when Her Royal Highness Beatrix, Princess of the Netherlands, reviewed a parade in her honor staged by the Columbia County and Hudson City Hudson-Champlain Celebration committees as a climax to the "Year of History." 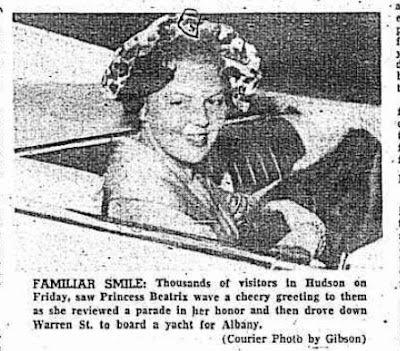 Rain clouds, which had brought intermittent showers throughout the morning, cleared just as the Princess and her party arrived at the house of Dr. John L. Edwards in Hudson, some 27 minutes behind schedule. Accompanying Her Highness was the Netherlands Ambassador in the United States H. J. van Roijen, her Naval aide, Commander W. W. Kuyck, her lady in waiting, Miss C. E. B. Roell, her secretary, Mrs. G. E. Scheulten-Meers, and a motorcade of foreign and American news reporters. Arthur McEvoy of Hudson, and a member of the Celebration's advisory board. Other committee members included Surrogate and Mrs. William F. Christiana, County Judge and Mrs. William E. J. Connor, Assemblyman and Mrs. Willard C. Drumm, City Judge and Mrs. Robert F. Meyers, Chairman of the Board of Supervisors Jay C. Moore and Mrs. Moore, Raymond C. Kennedy, chairman of the Hudson City Committee, and his mother, Mrs. Kennedy, and Mr. and Mrs. Burdell Bixby of Hudson. Also present were Dr. and Mrs. Henry Noerling of Valatie, Miss Elizabeth Dillenbeck, Dr. Edwards' niece, and Mrs. C. Davie Lloyd of Lee, Mass., a former Kinderhook resident, with whom Queen Juliana and Princess Beatrix spent the summer of 1942 when the royal family fled Holland following the German invasion. Following the brief reception, the Princess went directly to a reviewing stand at Park Place where a crowd of 3,000 cheered as she took the place of honor surrounded by county officials and members of her party. Hudson had the best glimpse of the dimpled princess of any of the river communities including New York and Albany. While she had only made brief public appearances in her upriver trip, at Hudson she sat patiently for an hour and a half while hundreds of cameras, handled by amateurs and professionals, were held only a few feet away from the photogenic young woman. The Princess evidently enjoyed the photo taking, but security officers finally shooed the cameramen away. The official party missed the first division of the parade because of their tardy arrival but were in time to see the second, third, and fourth divisions and all of the 43 floats in the order of march. The Princess was particularly impressed with some of the vintage American automobiles which she saw for the first time, the highly polished fire engines and the 4-H float entries. She is honorary president of a Dutch organization similar to 4-H. 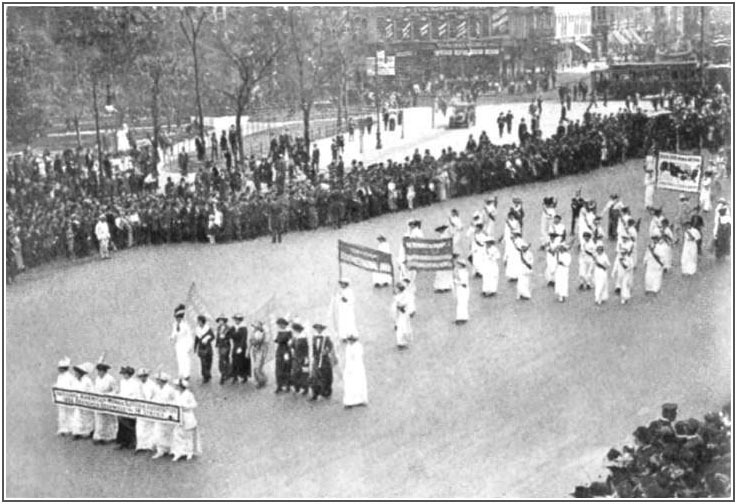 While 20,000 persons jammed Hudson's streets to witness the largest parade in the county's history, the attention of those in the vicinity of Park Place was focused on the Princess who wore a grey faille suit, a velvet forward (sic) beret in brown and grey paisley print and matching belt. A mink stole covered her shoulders but a borrowed cashmere coat was draped about her knees in the brisk 52 degree afternoon weather. During a brief break in the parade, Mrs. Henry J. Noerling of Valatie, a member of the committee's advisory board, presented the Princess a diamond-shaped star crystal paperweight of Steuben Glass. The engraving made especially for the Columbia County committee and approved by Netherlands authorities, was a lion rampant of the House of Orange, the initial "B" and the date September 18, 1959. In making the presentation, Mrs. Noerling said, "It was 350 years ago today that Henry Hudson, for whom this city is named, planted the flag of the Dutch East India Company on what was to become the soil of Columbia County. We present this gift as a token of our warm affection for you and with the sincere hope it will always be a pleasant reminder of this historic date of your visit to our countryside." At 3:25 to the shouts of "Goodbye Princess" the Royal party drove down Warren Street toward the Hudson Power Boat Assoc. dock where she was to board the yacht "Dauntless" for her trip to Albany. Along the way, there were a number of greetings in the Dutch language which the Princess acknowledged in Dutch. A small cheering section of four boys came up to her car and to the amazement of security officers yelled in unison--"Rah-rah-rah Beatrix!" At the dock area which was bedecked with flags another 400 persons applauded the royal visitor. Riding majestically in mid-stream was the destroyer U.S.S. Strong and a Coast Guard cutter. At 3:45 the Dauntless cast off and in the fading afternoon sunlight moved upriver escorted by the larger vessels. The rain which had ended just before the Princess' arrival began again but by this time the big party was over. 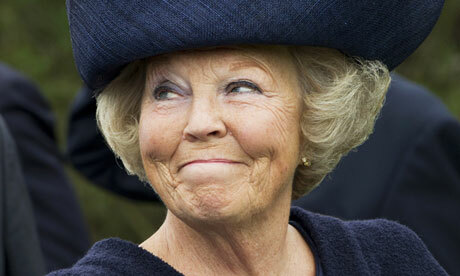 The photograph of Queen Beatrix is by Marcel Antonisse/EPA and appeared in The Guardian. Many residents of Hudson have been wondering how much power their representatives on the Common Council will lose or gain with the new weighted vote. All will soon be revealed. Common Council president Don Moore told Gossips yesterday that the new numbers had been received from Rutgers professor, Lee Papayanopoulos (shown at right), the wizard of the weighted vote, on January 23, the day of the last Legal Committee meeting. Because there was inadequate time for committee members to review the document and because Alderman Cappy Pierro (Fifth Ward) was away, the issue was not taken up at that meeting but will be discussed at the special Legal Committee meeting to be held on February 5. Just to review the issue, the chart below tracks the history of the weighted vote in Hudson since it was first implemented in the 1970s. The chart shows the number of votes the Common Council president and each alderman casts and the number of affirmative votes required for a simple majority. Comparing the numbers across the chart, nothing changed with the weighted vote until after the 2000 census. At this point, the votes of aldermen from the First and Fourth wards lost significant weight, those of the aldermen from the Fifth Ward lost a little, and the votes of the aldermen from the Second and Third Wards gained strength. In the 2010 census, all the wards lost population except the Fifth Ward, which gained 113 residents, but the big loser was the Third Ward, which not only lost residents but lost the right to include the population of the Hudson Correctional Facility in its count, making the total population loss for that ward 815. The New York State law that requires prisoners to be counted in the communities where they lived before they were incarcerated not in the communities where they reside as prisoners reduced the Third Ward population by 350 but also added 50 Hudson residents who are incarcerated elsewhere. It is not known which wards can claim those people. There are some issues that require a two-thirds majority or a three-quarters majority to pass. The sale of City-owned property is an example of a decision that requires a three-quarters majority. In these cases, not only is the number of affirmative votes needed different but also the number of votes cast by each alderman. This chart shows how the number of votes differs according to the type of majority. These are the numbers, based on the 2000 census, that are currently in use. Note that in the Third and Fifth wards, the two aldermen have different numbers of votes in a two-thirds majority. In each case, the alderman with the greater number of votes is the one who received a greater number of votes in the election. Papayanopoulos has, according to Moore, provided options for calculating the three types of majorities. These options will be reviewed at the special Legal Committee meeting on February 5, and a recommendation will be made to the full Council, perhaps introduced as a resolution, at the informal meeting on February 11. It should be noted that adopting the new weighted vote is subject to a permissive referendum, that is, the public can, through a petition, force a referendum on the weighted vote adopted by the Common Council in the November 2013 election. What would happen if such a referendum were to take place and the voters were to reject the proposed new weighted vote is unclear. Typically, the weighted vote numbers would go back to what they had been previously, but the previous scheme--that is, the current one--is illegal because it still factors in the prison population. There's gotta be an easier way to make representative government work in Hudson. 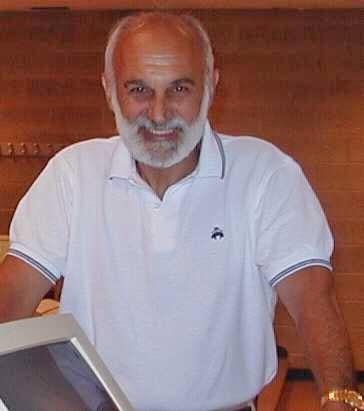 Gossips found the picture of Professor Lee Papayanopoulos on the Rutgers University website. Curious About What Those Surveillance Tapes Show? Last Tuesday, the Register-Star reported that the video from the City Hall break-in was public record and could be FOILed. Today, City Hall fulfilled FOIL requests. Gossips made a FOIL request and this afternoon took possession of a CD that contained the video. Victor Mendolia beat Gossips to the punch though and got the video and stills from the video on his blog first. So, rather than be redundant, Gossips is just going to send you to Diamond Street to see the show: "Who Broke into City Hall?" Some mornings just start out better than others. This morning began with the discovery, in my inbox, of these two amazing images, sent to me by a reader, showing the buildings that once stood on the west side of South Front Street. I think they are drawings, but the person who sent them says they are photographs. Either way, this is the first pictorial documentation that I have ever seen of these buildings, all of which were demolished during Urban Renewal. 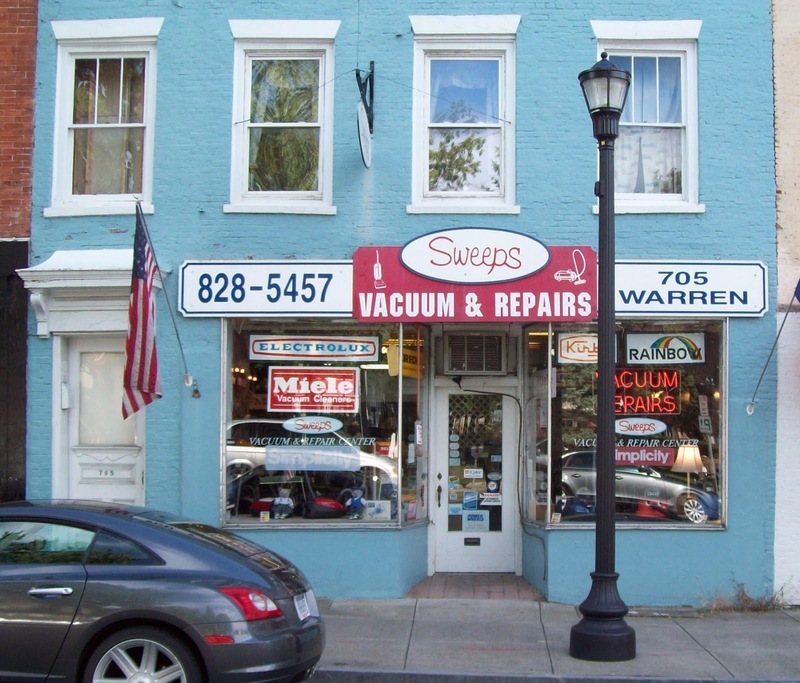 Beneath each image, I have quoted the descriptions of the buildings from the 1970 National Register application for the Front Street-Parade Hill-Lower Warren Street Historic District. 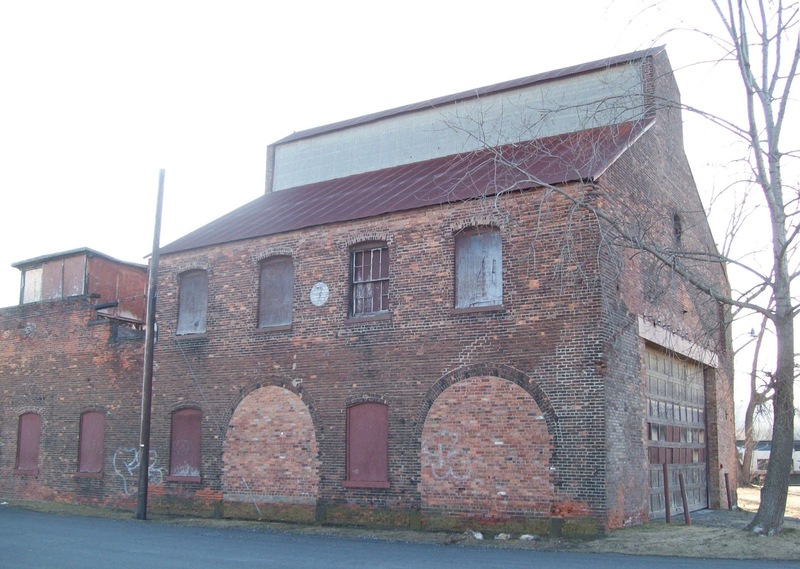 1 Three-story brick structure, gabled and semi-hip roof, five bays wide on West Warren Street, three bays wide on Front Street, flemish bond brickwork, brick flat arches, fan windows in gable. This structure was built in the late 1780's or early 1790's and used as a store by Marshall Jenkins, who was one of the original proprietors. 3 Three-story brick dwelling and store, three bays wide, gabled roof, stone lintels, flemish bond brickwork. 5 Three-story wood dwelling four bays wide, gabled roof, remodeled first floor. 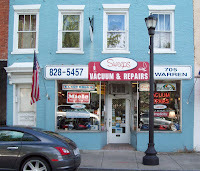 7 Three-story brick dwelling and store, three bays wide, flat roof, flemish bond brickwork, stone trim, original arched doorway trim intact, modern storefront. 9 Three-story frame dwelling, three bays wide, gabled roof, bracketed cornice, remodeled first story, modern asbestos siding. 27 Three and one-half story brick dwelling, five bays wide, gabled roof, bracketed cornice, flemish bond brickwork, splayed stone lintels, central arched doorway with original stone trim, fan windows in gable. 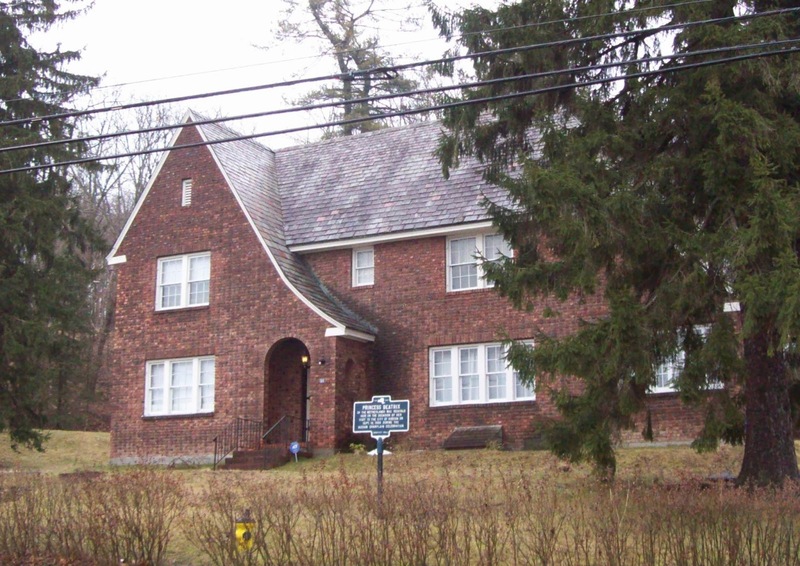 29 Three and one-half story brick dwelling and store, three bays wide, gabled roof, two dormers, splayed stone lintels, flemish bond brickwork, remodeled first story. 31 Three-story brick dwelling and store, two bays wide, gabled and flat roofs, common bond brickwork, remodeled first floor store front. 33 Two and one-half story brick dwelling and store, four bays wide, gabled roof, common bond brickwork, brick flat arches, first floor bracketed store front. 35 Three-story brick commercial and residential block, three bays wide on Front Street, seven bays wide on Fleet Street, flat roof, common bond brickwork, bracketed and paneled cornice, first floor store front. Two weeks ago, Gossips reported that the Register-Star had reported that Elizabeth Fout, vice president of the HCSD Board of Education, resigned midway through a public meeting. It turns out she never submitted a formal letter of resignation, so she never actually resigned. Lynn Sloneker has the story and a not-to-be-missed interview with Fout on her blog Unmuffled: "Fout will keep Board of Education seat." There were two Common Council committee meetings last night--Police and Fire--and at both meetings the topic of vacant houses came up--in different contexts. At the Police Committee meeting, Alderman Nick Haddad (First Ward), committee chair, gratefully acknowledged a service the Hudson Police Department provides to residents. He explained that people can notify the HPD when they are going to be away, and the police will make "special loops" to check on their houses. Haddad made a point of mentioning this in the aftermath of several house burglaries in the First Ward which occurred over the holidays when people were away from home. He noted that the people whose homes had been burglarized had not notified the police of their plans to be absent. At the Fire Committee meeting, Fire Chief Craig Haigh also talked about vacant buildings. He urged owners of second homes in Hudson and other buildings that are not occupied on a regular basis to be certain that the interior temperature is kept at a level that prevents pipes from freezing and bursting in extremely cold weather. He noted that so far this year the Fire Department has responded to fifteen calls to deal with burst pipes. 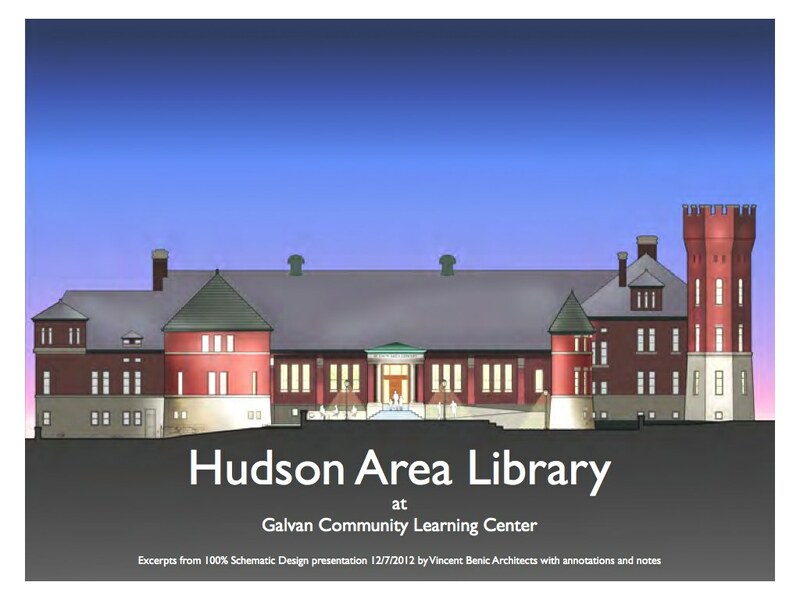 There has been speculation about a correlation between the number of buildings being warehoused by Eric Galloway and (1) the population loss in Hudson between 2000 and 2010 and (2) the perceived housing shortage and homeless problem in Hudson. Since the issue keeps coming up, Gossips tallied the number of potential housing units that are being warehoused by Galvan Partners and the Galvan Foundation and came up with a total of 55--both single-family houses and apartments in what had been multiple-family dwellings. According to 2010 census statistics, the average size of a household in Hudson is 2.28 people, so those 55 vacant dwellings represent homes for about 125 people. That number alone doesn't account for the population loss in Hudson, but it is certainly not insignificant. 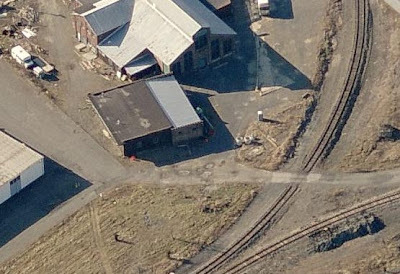 Last April, Debby Mayer, reporting for Columbia Paper, concluded that Eric Galloway at that time owned 2 percent of the taxable property in Hudson. Coincidentally, 125 represents about 2 percent of the current population of Hudson: 6,657. According to statistics published by the American Diabetes Association, 25.8 million adults and children in the United States--8.3 percent of the population--have diabetes. For those Hudsonians living with diabetes, Hudson Chautauqua departs from its usual offering of lectures of historic interest to host the Diabetic Support Group. The first meeting of the group takes place on Wednesday, January 30, at 6:30 p.m. The group will address issues of concern for Type I and Type II diabetics, including diet, education, medication strategies, and emotional support. There will also be speakers and diabetic educators from the Healthcare Consortium and Columbia Memorial Hospital. Admission is free, and nondiabetic friends and family members are welcome. 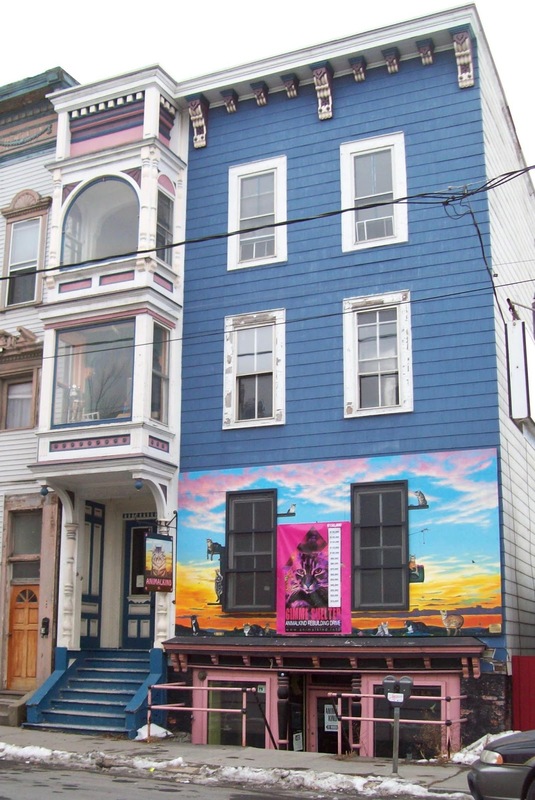 Hudson Chautauqua is located at 49A Eighth Street. Seating is limited, so early arrival is recommended. The Register-Star and the Daily Mail are running an Associated Press story today about the financial benefits to property owners from hydraulic fracturing: "Billions in gas drilling royalties transform lives." A search indicates that these papers seem never to have picked up any AP stories about the negative effects of fracking. According to reports, the windows in the oriel at 721 Warren Street were again a topic of discussion at Friday's meeting of the Historic Preservation Commission. The architect working on the project refers to the windows now in the oriel as "two super big ugly holes" and wants to replace them with windows with muntons. Jack Alvarez, the architect member of the HPC, says the oriel is "very Queen Anne" and thinks the pattern of muntons being proposed is inappropriate to the period. 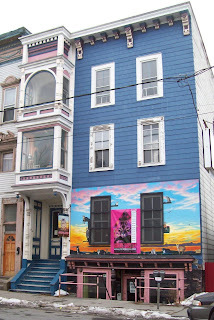 Ideally, such questions of appropriateness are resolved by referring to historic photographs that show what a building or a feature of a building was like before later alterations, but in this case no early pictures of 721 Warren Street have been found. So, for the sake of architectural authenticity on Hudson's main street, Gossips is appealing to its very resourceful readers. If you have a historic picture of this building which shows the oriel as it originally was, please contact Gossips and we'll get the image to the Historic Preservation Commission. Next Saturday promises to be warmer than today, but the forecast is still for cold weather. Next Saturday, significantly, is Groundhog Day—the day we find out how much longer we need to wait for spring. These two things make February 2 the perfect day for a Chili Cook-off at Christ Church Episcopal in Hudson. Unlike other chili cook-offs you may have experienced, where the cost of admittance buys you only a little sample of the various chilis entered in the competition, at this chili cook-off, your $5 admission ($3 for children under 12) lets you sample all six entries (one of which is promised to be vegetarian), vote for your favorite, and then get a large bowl of the chili you like best! 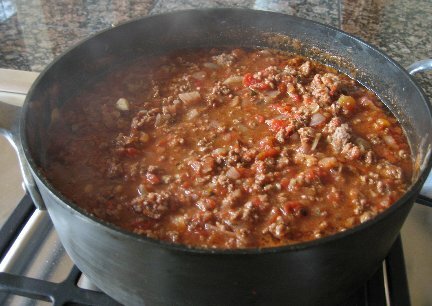 Besides the six varieties of chili, there will be garnishes (shredded cheese and sour cream) and accompaniments (corn muffins) and the homemade desserts that have made the Parish Hall lunch program famous. So whether Punxsutawney Phil sees his shadow in the early hours of Saturday morning or not, gather at the Parish Hall from 5 to 7 on Saturday afternoon to celebrate or commiserate over the outcome. The proceeds of the event support the church's outreach programs. The New York State Office of Fire Prevention and Control has released its study of the origins of the fire last August at TCI. John Mason has the story in today's Register-Star: "State cites 2 possible causes of TCI fire." It seems that, without the knowledge of town and county officials, TCI was leasing part of its warehouse to PSS--Power Substation Service--and the fire started in the area used by PSS. According to the report: "PSS processes transformer oils containing PCBs at a level higher then that which TCI is allowed to handle." Nice. TCI is seeking to rebuild their facility in Ghent. As we know, the City is committed to selling the old Dunn warehouse across the street from riverfront park in 2013 to close a gap in this year's budget, and Sheena Salvino has put marketing the property on the Hudson Development Corporation's to-do list for 2013. Last night at the Common Council Economic Development Committee meeting, Sarah Dibben made a terrific suggestion for the building: Make it an aquarium! Dibben made the point that there isn't another aquarium within 200 miles. When she uttered the word aquarium, fond memories of a day spent at the Monterey Bay Aquarium came to mind, as did the Maritime Aquarium at Norwalk. What a great destination an aquarium could be and what a wonderful way to showcase and promote the aquatic life of the Hudson River. What would it take to make it happen? City government in Hudson last night was a little like a two-ring circus. With Common Council committee meetings going on in the Council chamber at City Hall, the Planning Commission's public hearing on Basilica Hudson's proposed solar array was moved across the street to the Hoysradt firehouse. Perhaps because they had expected the Planning Commission to waive the public hearing or because the first tentatively scheduled public hearing didn't happen, the folks from the Basilica were there in force, along with a number of advocates for solar energy--both installers and users, the latter apparently all from Livingston--and several elected officials, including First Ward alderman Nick Haddad who had written a letter of support for the project, as did First Ward alderman David Marston. Those who hadn't come to the hearing to endorse the project, Basilica Hudson, or Hudson Solar were there to understand the impact of the structure on the viewshed. 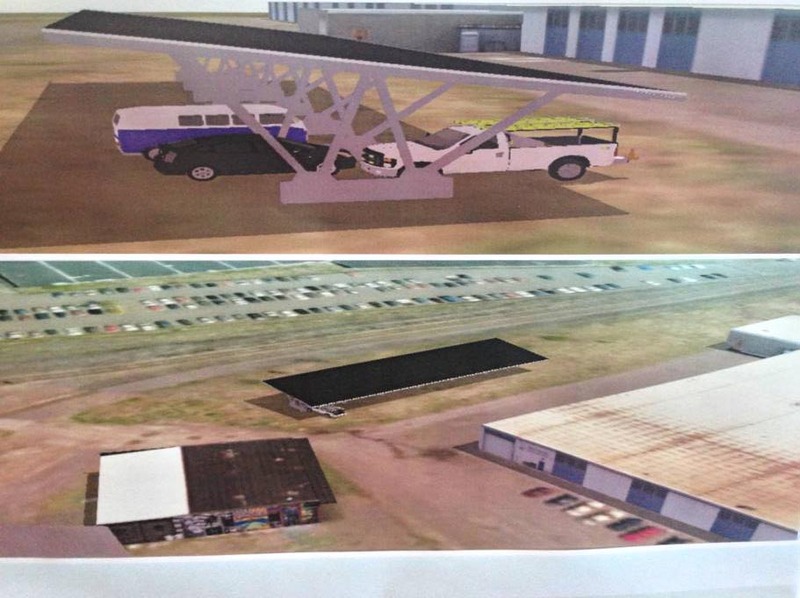 The renderings presented (which are badly reproduced below) and Basilica owner Melissa Auf der Maur's description of the structure as "handsome and subtle" and "camouflaging itself into L&B" reassured the people concerned about the viewshed that those proposing the project had been sensitive to how the solar panels would fit into the landscape. Some additional information about the structure emerged last night. Auf der Maur explained that it was to be a 50-kilowatt system that would produce enough electricity for the Basilica's needs as well as excess that would go back into the grid. Compare that with the 53-kilowatt system being proposed for the Central Firehouse, which is anticipated to produce only 51 percent of the electricity required by that building. The comparison says something about the amount of electricity consumed at the firehouse. The array at the Basilica will consist of 210 solar panels and will be 32 feet wide and 117 feet long. The panels will be positioned at a 10 degree angle, directed toward the south. At its lowest point, the structure will be 8½ feet high; at its highest point, it will be 16 feet high. There will be space for 24 cars to park beneath it. After the public hearing was adjourned, the Planning Commission convened a special meeting to vote on the application. The five members of the commission present--Don Tillson, chair; Gail Grandinetti, Cleveland Samuels, Laura Margolis, and Claudia DeStefano--voted unanimously to approve the application. Commission members Cappy Pierro and Glenn Martin were absent. Superintendent Rob Perry reported last night at the Common Council Public Works Committee meeting that a dead tree, clinging to the edge of the bank in riverfront park, had been removed, thus eliminating a minor obstruction to the view of the Holcim dock from Rick's Point. This picture of the tree, partially cut, was taken during Superstorm Sandy and supplied to Gossips by Superintendent Perry. In the aftermath of the tragedy at Newtown, Connecticut, the Legal Committee of the Common Council started drafting legislation to ban guns from all city-owned property, including City Hall and all city parks. The proposed legislation was on the agenda for discussion at last night's Legal Committee meeting. 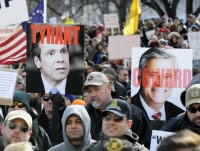 While New York State's anti-weapons bill inspired thousands of gun owners to rally in protest last weekend, the pro-gun lobby at City Hall last night consisted of one white-haired lady, identifying herself as Barbara Van Allen of Claverack, who called the legislation being discussed "a bunch of baloney." The photograph by Hans Pennink for Reuters appeared in the New York Daily News. At was the queer old complexion of the long straight street, however, that most came home to me: Hudson, in the afternoon quiet, seemed to stretch back, with fumbling friendly hand, to the earliest outlook of my consciousness. As he walked up the dead-straight backbone of the town, he saw, on brand-new signs announcing each cross street, the same grinning whale. Why whales? He vaguely recalled being taught in school that Columbia had been a whaling port. . . . In the haze of this last leg of his journey up Washington, one sight stopped him. Just over Third Street, across from the neglected Painted Lady Lounge, was the General Worth Hotel. Once grand, it was now falling down. 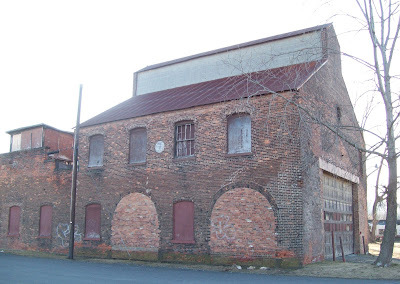 It was three stories tall, nine windows wide, made of brick. Now all the windows were boarded up or broken, graffiti and bullet holes were prominent, and the classic portico held up by four Doric columns was sagging badly to the right. An old sign read GENERAL WO HOT . Orville had a vision of his mother, wearing a dazzling cobalt-blue satin gown, as President of the Hospital Auxiliary at the annual Spring Fling benefit, flanked by her beloved candy stripers as she made her grand entrance down the majestic staircase to the ballroom of the Worth. The novel is The Spirit of the Place. The author is Samuel Shem, known to some in Hudson as Dr. Stephen Bergman. Bergman, who grew up here, "expatriated" in the early 1960s when he went off to college, but he will be back this Saturday, January 26, to celebrate the release of the paperback edition of The Spirit of the Place, his novel set in Hudson, with a reading and book signing. The event, which promises to be enlightening and entertaining, takes place at 2 p.m. at the Hudson Opera House. The archival picture of the General Worth Hotel, taken shortly before it was demolished, is from the Library of Congress. Last week, while exploring the old newspapers at Fulton History, Gossips learned about a fair in aid of Edmonds Hose Co. No. 1 to be held on February 13, 14, and 15, 1913, and reported about it. 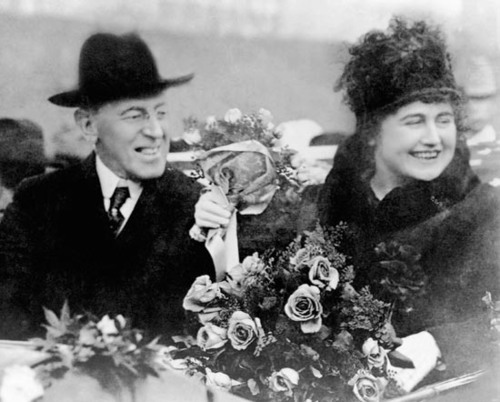 The fair was to include a "Most Popular Young Lady" contest--a traditional contest for such an event with a very untraditional prize: a trip to Washington, D.C., for the inauguration of President Woodrow Wilson. Gossips was curious to know why this trip was thought to be especially appealing to the ladies of Hudson and who won the prize. An hour or so spent with the microfilm in the Columbia-Greene Community College library revealed the answer to the latter question but not the former. The surprise of the night was the exceedingly heavy vote cast for Miss Helen E. Kline, daughter of Supervisor and Mrs. William J. Kline. She was awarded the free trip to Washington, D.C., having the largest number of votes in the contest for the most popular young lady. Miss Emma Fleahman also made a strong run was second in the contest. The final result was: Miss Kline, 1,635; Miss Fleahman, 713. Disappointingly, no account or mention could be discovered in the Hudson Republican of Miss Kline's trip, but further research in other sources discovered this information about her. Helen C. Kline was born in 1898, so at the beginning of 1913 when she won the "Most Popular Young Lady" contest, she would have been 14 years old. Her parents were William J. and Charlotte (Lottie) Kline, and she had a brother, four years older, named Everett. In 1900, when Helen was just a year old, census records indicate that the family lived at 749 Columbia Street, and her father's occupation was recorded as "saloon keeper." 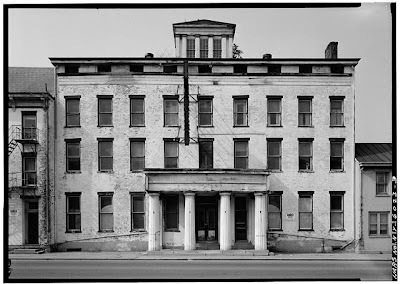 Ten years later, in 1910, census records indicate that the family was living at 705 Warren Street, and William was the proprietor of a hotel, which we know from the 1905 booklet Illustrated Hudson, N.Y. was Kline's Hotel. The description in that booklet gives some hint of where Helen got her predilection for popularity: "As mine host Mr. Kline is one of the most genial of his kind in the city, and this fact has been a potent factor in building up the fine trade he enjoys." 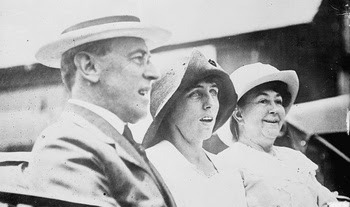 We know from the Hudson Republican item announcing Helen as the winner of the trip of Washington that her father, William J. Kline, was, in 1913, a supervisor. By 1915, according to New York State census records, he was the sheriff, and the family, which now included a 39-day-old son named William J., Jr., lived in the house on East Court Street, behind the courthouse, which was the residence maintained for the sheriff. On August 30, 1916, the Hudson Evening Register reported that Miss Helen E. Kline showed an English setter in the "Big Dog Show Here at Homestead Park." On January 17, 1917, Miss Helen E. Kline was married to Claude J. Weaver, son of Mr. & Mrs. Walter Weaver, who lived on Eighth Street. The wedding, which took place at the parsonage of St. John's Lutheran Church, wasn't announced in the Hudson Evening Register until March 1, 1917, when it is noted that the new Mrs. Weaver, "who has recovered from a recent illness," left that afternoon to join her husband in Waterville, Connecticut, where he had "an excellent position with the Chase Manufacturing company" and where the couple were to make their home. Interestingly, the wedding announcement reminds us that "the bride . . . is a very popular young woman." Basilica Hudson is planning to go solar, but instead of putting the photovoltaic panels on the roof of the building, the plan is to create a separate structure to hold the array which will do double duty as a covered car park. This structure, which will be located slightly north and east of the smaller building on the Basilica site, will be visible from the back of most of the houses on the south side of Allen Street below Third, as well as from houses on the south side of Cross Street and Tanners Lane. 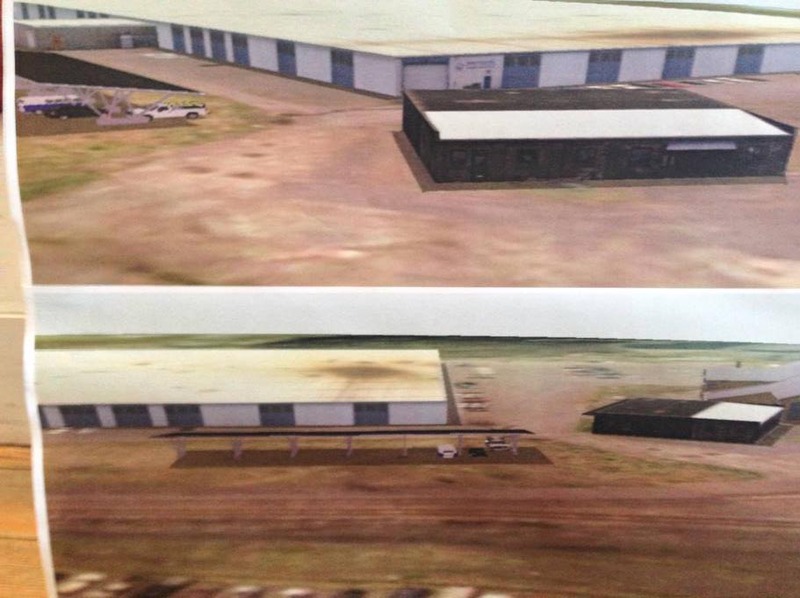 A public hearing on this project had been tentatively scheduled for January 9, but because of a breakdown of communication between the chair of the Planning Commission and legal counsel, it didn't happen on that date and was rescheduled for January 23. The public hearing will take place at 6 p.m. at City Hall, followed by a special meeting at which the Planning Commission will make a decision about the project. City Hall has a jam-packed agenda for Wednesday night, since the Common Council Public Works Committee is scheduled to meet at 5:30 and the Legal Committee at 6:15. Solar energy is a good thing, and there is no reason to believe that the array being proposed, positioned as it is and masquerading as a covered parking area, will be an unattractive or even a noticeable addition to this part of the waterfront, but people should know what's being proposed for their viewshed, and Gossips urges residents of the southern edge of the First Ward to attend the hearing to find out. Joe Gentile reports in today's Register-Star that city officials have confirmed that the City Hall surveillance footage which is evidence of the March 2012 break-in is available to anyone who files a FOIL request: "Video of City Hall break-in is a public record." 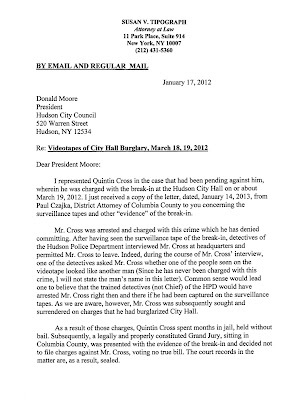 Mayor William Hallenbeck is quoted in the article as saying, "The city of Hudson has the rights to these records, and individuals have the right to FOIL them. We're abiding by FOIL laws." Following General Rosalie Jones and her Army of the Hudson led Gossips out of its comfort zone of local history into the realm of national politics a century ago. Before we retreat back, there's one more discovery to share. The presidential election of 1912 was unusual in that there were four candidates. Theodore Roosevelt, who had supported his successor, William Howard Taft, in 1908, wanted, four years later, to run again himself. 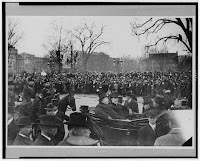 Failing to win the nomination of the Republican Party (that went to the incumbent Taft), Roosevelt formed his own party--the Progressive Party, also known as the Bull Moose Party. Woodrow Wilson, of course, was the Democrats' candidate, and, with Eugene Debs running as the candidate of the Socialist Party of America, voters--still all men--had four candidates to choose from. 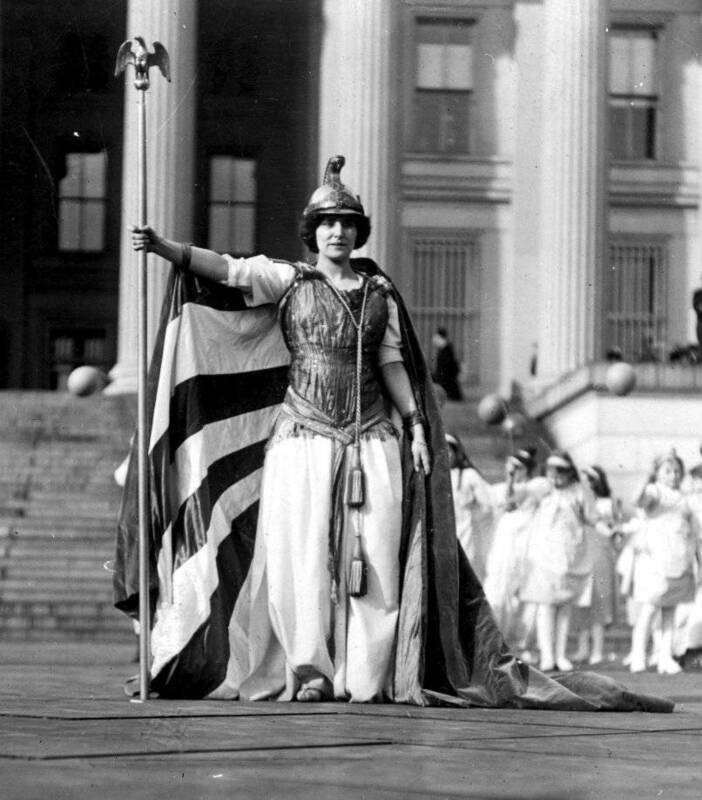 In 1912, the suffragists were ramping up their battle for the vote, and Wilson was not the best choice as President to help them achieve their goal. Theodore Roosevelt was. In 1912, Roosevelt's Bull Moose Party was the first national political party to have a plank in the party platform supporting woman suffrage. 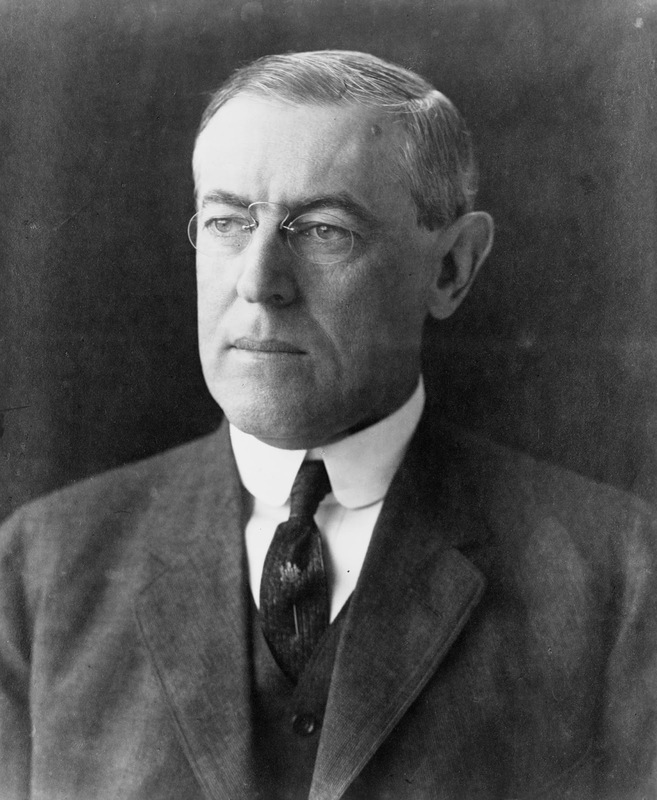 Wilson, as did Taft, opposed federal woman suffrage. It wasn't that Wilson disliked women. Louis Auchincloss described him as someone who "simply could not live without the love and approval of an attractive and sympathetic woman." When his first wife, Ellen Axson Wilson, died in August 1914, Wilson was devastated. His health deteriorated, he fell into depression and talked of resigning. When he met Edith Bolling Galt, the charming and wealthy widow who would become his second wife, he was smitten. In June 1915--less than a year after Ellen's death--they were secretly engaged. They were married, after little more than the minimum wait required by respectability, in December 1915. A comment, recounted by Auchincloss, gives insight into why suffragettes would have a problem persuading Wilson to support their cause. Wilson, Auchincloss tells us, once referred to "the chilled, scandalized feeling that comes over me when I see and hear women speak in public." In case you didn't know, today is the first day of No Name-Calling Week. Inspired by The Misfits, James Howe's novel for young adults, the week-long event involves educational activities meant to help end name-calling and eliminate bullying. Name-calling isn't really a problem on this blog, but from time to time, a comment is punctuated by a disparaging word, and although the substance may be cogent and relevant, Gossips has been criticized for publishing and implicitly tolerating what is perceived as name-calling or finger-pointing. So, at the start of No Name-Calling Week, Gossips urges commenters to make their very pertinent and valid points without using contemptuous epithets like toady, clownhead, or troll—even when such words are used, as is often the case, in apophasis. 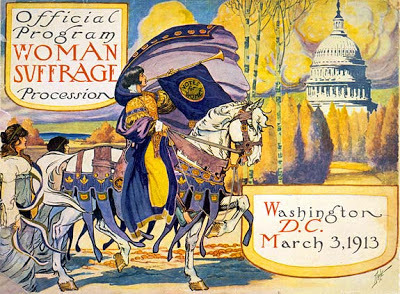 WASHINGTON, March 3--In a woman's suffrage demonstration to-day the capital saw the greatest parade of women in its history. In the allegory presented on the Treasury steps it saw a wonderful series of dramatic pictures. 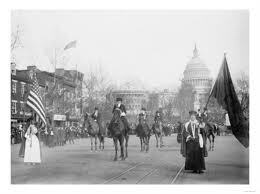 In the parade over 5,000 women passed down Pennsylvania Avenue. Some were riding, more were afoot. 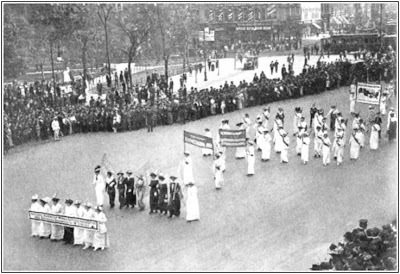 Floats throughout the procession illustrated the progress the woman's suffrage cause had made in the last seventy-five years. Scattered throughout the parade were the standards of nearly every State in the Union. It was an astonishing demonstration. The historic images reproduced below provide a sense of the visual spectacle, but readers are encouraged to read the entire New York Times account, which includes wonderful descriptions of the costumes worn by women in the parade such as this: "Miss [Inez] Milholland [of New York] was an imposing figure in a white broadcloth Cossack suit and long white-kid boots. From her shoulders hung a pale-blue cloak, adorned with a golden maltese cross. She was mounted on Gray Dawn, a white horse belonging to A. D. Addison of this city. 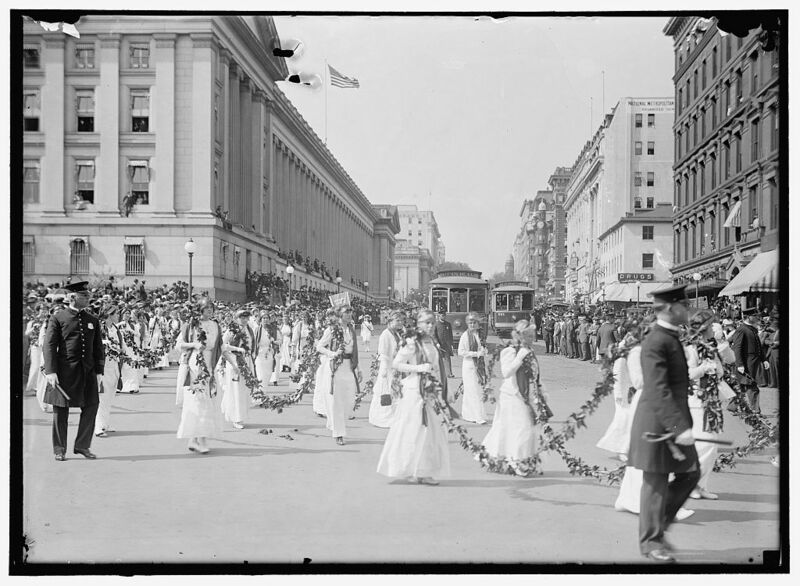 Miss Milholland was by far the most picturesque figure in the parade." It was estimated that 500,000 people gathered to watch the parade. 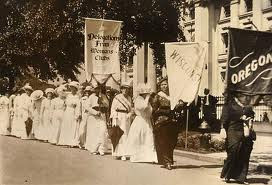 Many them, including the police charged with protecting the marchers, were unsympathetic to the cause of woman suffrage. Not only did the police fail to restrain the rowdy crowd, some of them joined in the jeering. Mrs. Genevieve Stone, the wife of a congressman from Illinois, reported that a policeman had shouted to her, "If my wife were where you are I'd break her head." Testifying the following week before a Senate Investigating Committee convened at the request of the suffragists, Major Richard Sylvester, the Chief of Police in Washington, "produced the orders he had given for the protection of the marchers and the clearing of Pennsylvania Avenue, and disavowed personal responsibility for the failure of any of his men to carry out those orders. He shifted the blame and responsibility to the officers and policemen on duty on Monday who failed to protect the procession." 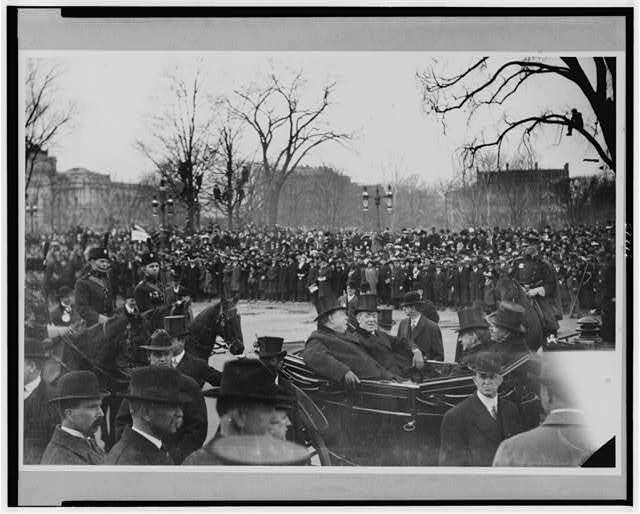 The New York Times reported that Sylvester had tried to dissuade the suffragists by warning them that "the riff-raff of the South would be here for inauguration on account of the Democratic victory." What, then, did we have in Washington? 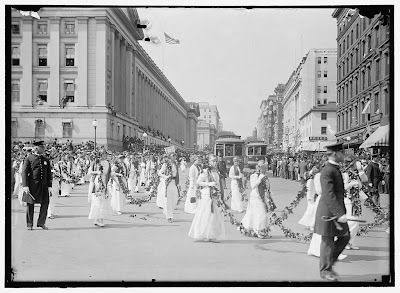 A parade of women, some of them decently clad, but some of them, if we may believe the accounts, clad in a way in which no good father or mother would wish his daughter to appear in public, exposing themselves to the gaze of the crowd which filled the streets of Washington, and which was nearly as numerous as the population of that city. In those circumstances it was physically impossible for ten times the police of Washington to keep the crowd in order. Men, with self-restraint in such circumstances would, of course, abstain from violence and keep away. The spectacle to them was disgusting in the main. But all the more the crowd, who had not self-restraint, would go and express their disapproval in the way they did. 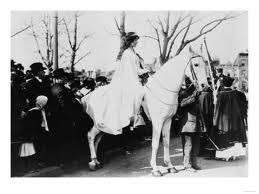 All of which shows what we have been telling the suffragists for years, that their attempt to bring women into political warfare with men would break down the protecting barriers which courtesy and chivalry have thrown around women. If women fight men, men will certainly come to fight back, and whether they like it or not, the suffragists will find that men despise them if, under the pressure of the fight, they whimper and complain. Gossips Is Three Years Old! It may have been kismet, but January 20, the day on which, every fourth year since 1933, the President of the United States is inaugurated, is also Gossips' birthday! Since the public celebration of Barack Obama's second inauguration has been postponed until tomorrow, the day is free to celebrate the third anniversary of the inauguration of The Gossips of Rivertown. On January 20, 2010, The Gossips of Rivertown published its first post. Three years and 2,537 posts later, Gossips has become a source of information and entertainment that people with an interest in Hudson rely on and value. In the past year, Gossips had more than half a million pageviews, setting a record in April of 2,000 pageviews in a single day and then exceeding that number so many times we stopped counting. Recognizing its reach, people asked to advertise on Gossips, and Gossips happily obliged. Also last year, 130 readers showed their appreciation for Gossips' unique brand of hyperlocal news and commentary by setting their own subscription rate--anywhere from $10 to $250--and becoming "voluntary paid subscribers." 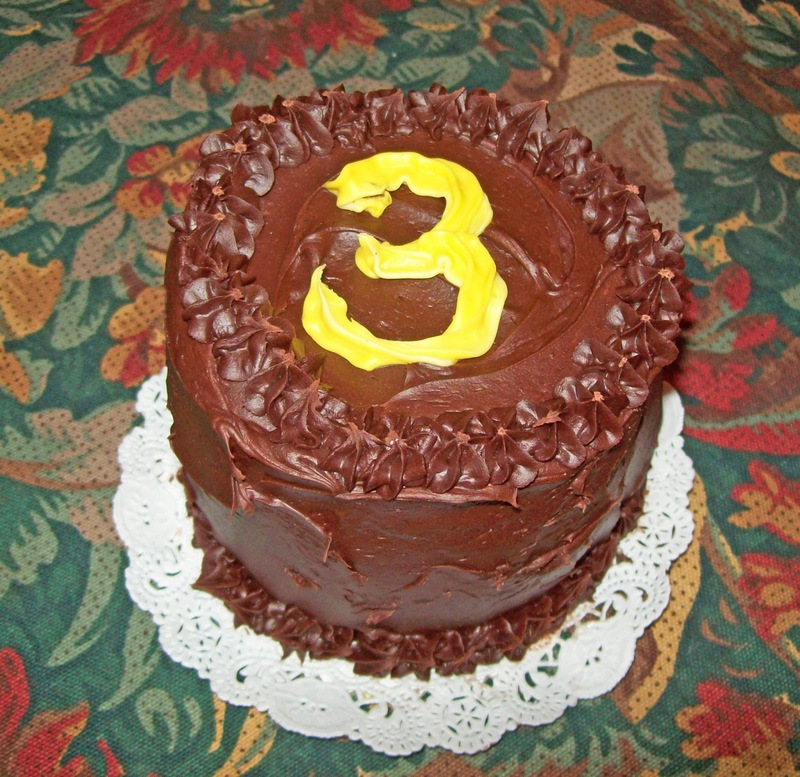 On its third anniversary, Gossips invites you to join the celebration of what may be Hudson's best read blog and add your name to the list of 2013 Subscribers. Just click on the "Donate" button in the right column. Your support--in any amount--is deeply and humbly appreciated. 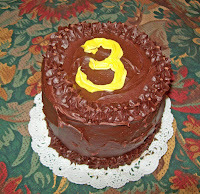 Gossips' third anniversary cake, created by Christine Jones of The Red Barn, came from LICK: The Market. 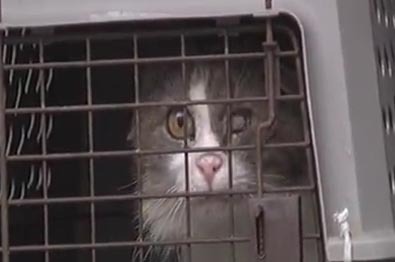 Animalkind's headquarters and shelter for homeless cats at 721 Warren Street was extensively damaged in a fire last spring. Now the organization is mobilizing to rebuild, with the intent of making the shelter "even better than before." To prepare, we've done in-depth research on how to maximize cat health and minimize cat stress in a shelter environment. We've consulted with leading vets and shelters across the country on best practices. . . . Instead of open floors, we're planning smaller rooms to house smaller cat communities--which have proven to reduce stress and infectious disease. We're rebuilding with high-tech impermeable materials throughout to improve hygiene and reduce infection. We're also building a fully operational surgical suite and infirmary so we can provide immediate care to the sick and injured . . . and perform spay/neuter on site. To help finance the project, Animalkind has launched the GIMME SHELTER Rebuilding Drive, with the goal of raising $150,000. At the Common Council meeting last Tuesday, Council president Don Moore read aloud a letter he had written to Columbia County district attorney Paul Czajka and Czajka's response to that letter. 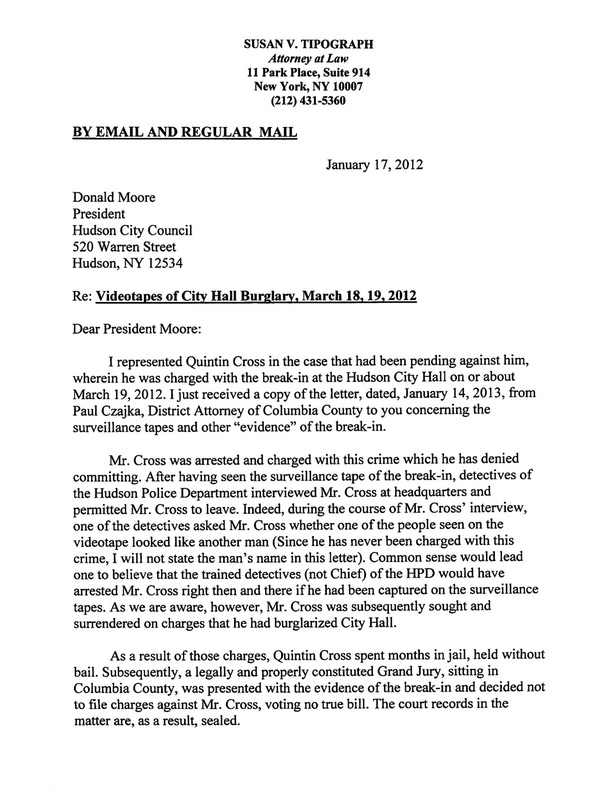 The subject of Moore's letter was the evidence in the City Hall break-in. The day before yesterday, on January 17, Moore received another response to his letter, this one from Susan V. Tipograph, the attorney who represented Quintin Cross. A copy of Tipograph's letter has come into Gossips' possession, and it is reproduced it here. 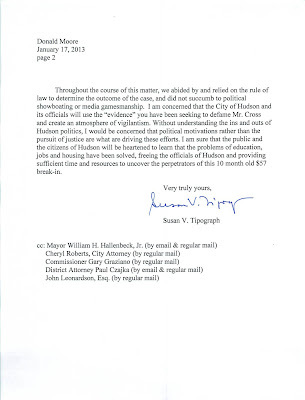 After having seen the surveillance tape of the break-in, detectives of the Hudson Police Department interviewed Mr. Cross at headquarters and permitted Mr. Cross to leave. Indeed, during the course of Mr. Cross' interview, one of the detectives asked Mr. Cross whether one of the people seen on the videotape looked like another man (Since he has never been charged with this crime, I will not state the man's name in this letter). Common sense would lead one to believe that the trained detectives (not Chief) of the HPD would have arrested Mr. Cross right then and there if he had been captured on the surveillance tape. Compare this account with what Chief Ellis Richardson told Gossips on March 28. 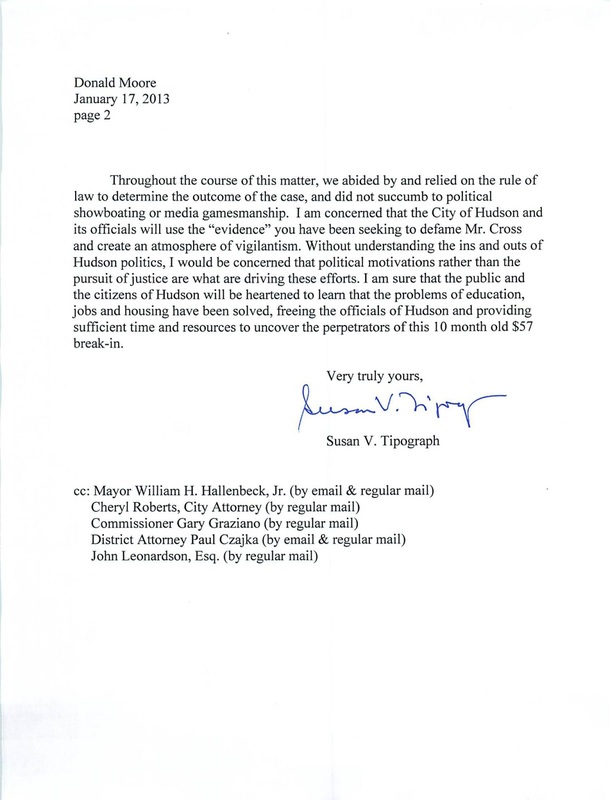 I am concerned that the City of Hudson and its officials will use the "evidence" you have been seeking to defame Mr. Cross and create an atmosphere of vigilantism. Without understanding the ins and outs of Hudson politics, I would be concerned that political motivations rather than the pursuit of justice are what are driving these efforts. 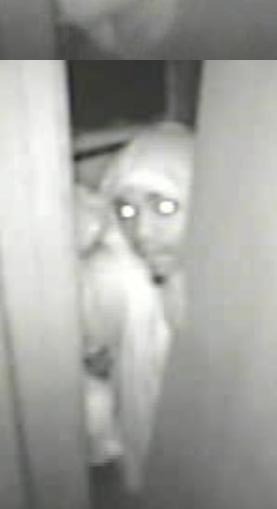 I am sure that the citizens of Hudson will be heartened to learn that the problems of education, jobs and housing have been solved, freeing the officials of Hudson and providing sufficient time and resources to uncover the perpetrators of this 10 month old $57 break-in. As rhetorical strategies go, the final sentence strikes this reader as not only sarcastic but a bit of a red herring. At the beginning of the last century, there were two newspapers in Hudson: the Hudson Republican and the Hudson Evening Register. The political bias of the former is obvious from its title; the latter unabashedly identified itself as "the official Democratic paper." 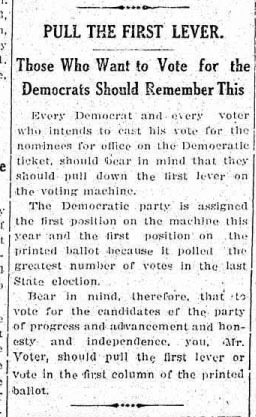 But even recognizing the partisan nature of newspapers at the time, a reader today will still be surprised that this item was presented as news in the Evening Register on the day before Election Day in 1911. Exploring the origin of the expression "keeping up with the Joneses" led to the discovery that its inspiration was Wyndcliffe, a grand house in Rhinebeck, built for Elizabeth Schermerhorn Jones in 1852. Today, Wyndcliffe is a magnificent ruin, and legend has it that the ghost of Miss Jones interferes to prevent the house from being restored. Gossips' attention to Wyndcliffe prompted a reader to share these pictures of Wyndcliffe, taken in 2003. 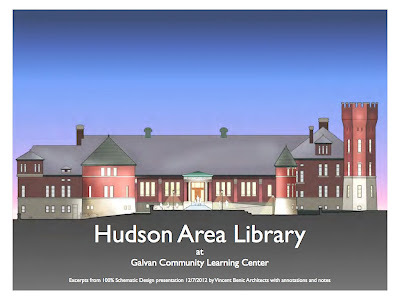 If you're curious about the future location of the Hudson Area Library, the final schematic design, which was approved by the Board of Trustees last Wednesday, can now be viewed at the library's website. When Is a Democrat Not a Democrat?